Jan. 9, 2013 - PRLog -- Following in the footsteps of its popular predecessor, the second edition of this workbook explains how to apply kanban replenishment systems to improve material flow. 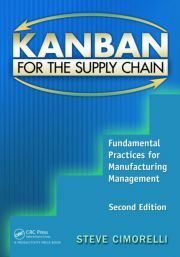 Kanban for the Supply Chain: Fundamental Practices for Manufacturing Management, Second Edition provides readers with a detailed roadmap for achieving a successful and sustainable kanban implementation. This book is for those who are ready to stop thinking about a conversion from materials requirements planning push techniques to kanban pull techniques and want to make it happen now. Stephen Cimorelli provides actionable advice for installing fundamental kanban concepts that can immediately help you increase manufacturing productivity and profitability. The book includes team-based exercises that reinforce key principles as well as a CD with helpful outlines, charts, figures, and diagrams. Steve Cimorelli is an educator, speaker, and author in the field of materials and supply chain management. He holds a BS degree in industrial engineering from the University of Central Florida and is certified at the Fellow level by APICS in production and inventory management (CFPIM). He has more than 30 years of experience in manufacturing, engineering, materials, and supply chain management in a variety of industries, including aerospace and defense, industrial equipment, and commercial products. For the past 10 years, Steve has led and consulted with numerous distribution centers and manufacturing plants around the world, developing and implementing Lean manufacturing and materials excellence practices, especially in the areas of kanban, forecasting, line balancing, and production stabilization. Mr. Cimorelli was first introduced to Lean manufacturing and just-in-time principles in the late 1980s while working toward his certification in production and inventory management (CPIM) with APICS, the Association for Operations Management. As he explains, "These ideas resonated so strongly with me that I began to actively seek opportunities to put them into practice. It wasn’t until 1995, when I joined Square D–Schneider Electric that I saw first-hand how they actually worked. From that point on, I became a vocal advocate and implementer of these practices throughout Schneider Electric and elsewhere through consulting work, teaching, and publishing." His other published works include "Lean Six Sigma for a Leaner Supply Chain" in Driving Operational Excellence (Metaops Publishing, 2010), "Control of Production and Materials" in the Handbook of Manufacturing Engineering (Marcel Dekker, 1995), and two cover stories in APICS—The Performance Advantage magazine, "Reduced Demand" (2002) and "Anticipating the Reemergence of Demand" (2010). These and other works can be found online at SCCInventory.com. Mr. Cimorelli lives in Titusville, Florida, with his wife, Cindi, English Springer Mr. Darby, and the enduring memory of their Springer Spaniel Ranger the Dog.